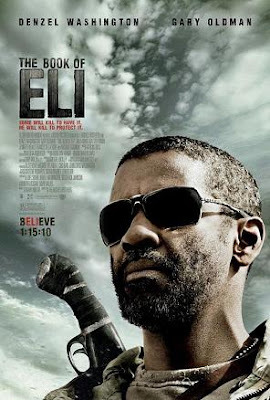 As follow up to last week’s post on St Thomas and the virtue of religion, here is a description of a talk I heard recently on the film The Book of Eli. This is a film about faith which in some ways frustrated me because it wasn’t more Catholic. If the screenplay writer had known about Thomas Aquinas and the virtue of religion, it might have made it even better! I won’t give a detailed review - I don’t want to spoil it for those who haven’t seen it - but I will try to give you just enough to see how I thought a reading of St Thomas might have added to it. The film, starring Denzel Washington, is set in a post-apocalyptic time in which there is no Church, and he is the only man who has access to Revelation in the form of a single Bible. All bibles, except the one owned by Eli, have been destroyed. We see no other aspect of Tradition surviving. Eli reads Scripture daily and absorbs what he reads, so that he becomes a man of faith who attempts to lead a virtuous life and prays daily to his Creator. In time, his faith is passed on to others, not by the words in the book or by his preaching, but by the example of his life. For example, he makes a sacrifice of love, and it is through this action that the one whom he saved becomes a believer too. It is a fascinating idea, stylishly told, but I would have loved to have seen the Church re-emerging as he reflects on his faith, and with it, a ritual of worship. This would have been natural to him. The review I wrote is here. As interesting as the film itself is the story of its making. The screenplay is by an Englishman called Gary Whitta who says he is an atheist. Nevertheless this a film about faith, and Whitta clearly knows his Bible. It was a big budget movie, just under $90 million. During the making of the film, the directors tried, from time to time, to play down the scriptural content, but Denzel Washington, whose father was a pastor and who is himself a Christian, insisted on keeping the Biblical content in the dialogue. When Warner Brothers saw the completed movie, they didn’t know what to do with it, and, feeling uncomfortable with the Scriptural element, didn’t put a lot of effort into publicity when it was released. It was presented as a futuristic and post-apocalyptic movie, marketed to the same people as might watch the Mad Max series. It didn’t succeed with this market, but began to gain ground in the “red states” in the US. Believing Christians, and especially Protestants, started to watch it, and eventually it made a clear profit with box-office takings of about $157 million. The story of the making of the film says to me that well-made films with intelligently incorporated themes of faith will succeed at the box office. What dismays me, however, is that it didn’t have a stronger Catholic theme, as distinct from a broadly Christian theme. 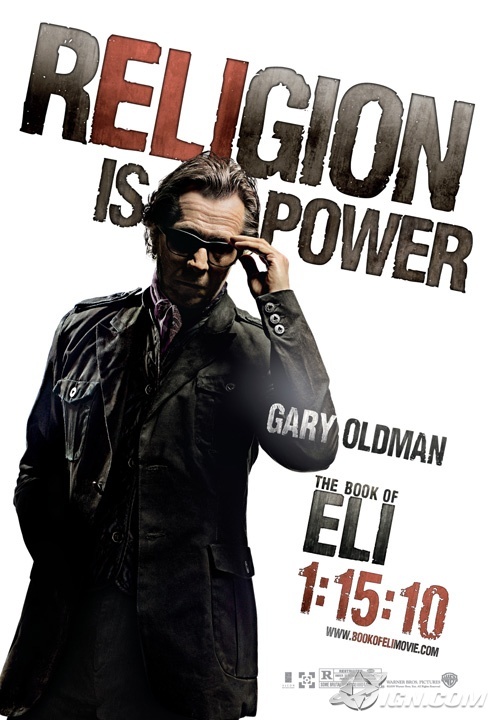 There is no direct reference to the Church, but one might, perhaps equate the villainous intentions of Carnegie, Gary Oldman’s character, with an erroneous Protestant view of the Roman church as an organ of state control, and one that moved away from the Church that Christ established. A more Catholic version of this film, would perhaps see the persistence of the Church in such a way that the Apostolic succession would be unbroken. Through this, as the Faith spread, so would the desire to worship God, the natural inclination of any man who has faith. This is where the ideas of St Thomas might come into the picture. St Thomas describes what he calls the “virtue of religion,” mankind’s natural propensity, when he reflects upon his faith, to worship God. The assumption here is that the event which these people survived, though widespread and destructive to civilization, and in this sense “apocalyptic”, was not the final end. It was not the Apocalypse of the described in the last book of the Bible. If it had been, then of course redemption would have taken place in the Second Coming of Christ, and this would be a film about the bodily resurrection of all Christians.